Product information "HAIX Mission Sage, FS"
Nubuck leather/Textile combination, hydrophobic, breathable, 2.0 – 2.2 mm thick. GORE-TEX® Extended; 3-layer GORE-TEX® laminate, waterproof and breathable. Highly abrasion-resistant lining with fleece midlayer. Optimized- climate comfort for all year seasons and excessive use. Rubber/PU walking sole with proven street/ terrain tread, wear resistant and non-slip traction; large, bevelled contact surface and superior bending comfort. Oil and gasoline resistance and non-marking characteristics. Heat resistant. Two Zone Lacing System enables a seperate adjustment of the boot to the foot and leg area. Lacing system with eyelets permitting smooth movement, pulling strap, lace pocket, manually applied rubber sidewall on the front and back of the shoe for a better durability, antistatic. 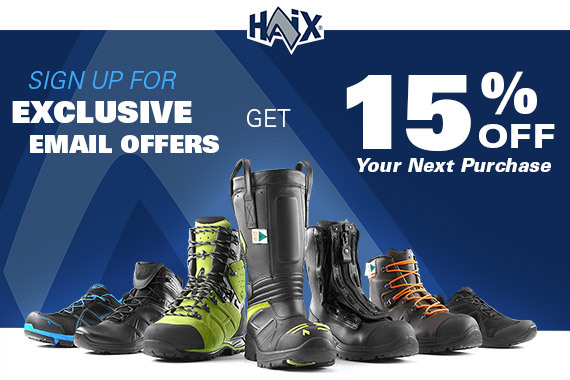 Related links to "HAIX Mission Sage, FS"
Our comment on "HAIX Mission Sage, FS"
Customer reviews for "HAIX Mission Sage, FS"
Top Quality, Stiff yet comfortable, RUGGED! This boot is a high end option that will endure the harshest, sharp and ankle twisting geography! Secure lacing means you are locked in, loose or tight, as th actual secure loops lets you breath and relax, or becomes part of you! Ankle support is great for a shorter boot than some, but, THESE do offer support! Make no mistake about the waterproofing, THIS KEEP YOU DRY...AND I STILL CAN NOT IDENTIFY ANY FLAWS to make it a second! Which tells you HAIX is about perfection!! If shale and worn footware is something that you are experiencing on the regular...in CERTAIN PLACES where lightweight boots get eaten allive, these are for you! Reinforced toe means guarded while kneeling on debris that shreads nylon/suede/unprotected footwear! If your kicking through rubble, the deep heal cup gives you a positive sense of stability and traction with the gripping sole! A sole hike worthy, but still good on your body! These are not a lightweight vesion, tho faster than most THIS DURABLE! For an assaulter style, the athletic verions may be a better option. For long hours on and off the hike, vehicles and inpectiong through the worst urban leftovers, THIS is good! Range day, daily wear, where safety toe is not needed, but comfort can not be compromised amongst the usual that destroys our fotwear, these are ROCKSTARS! Thank you so much for your rave review. We are happy to hear that you are pleased with the Mission Sage, FS and that it is performing just as well as a first. We appreciate your feedback and support and hope you will continue to be a customer in the future.